international life: She was born in India, and lived in Ottawa, Canada, before moving to Boston seven years ago. 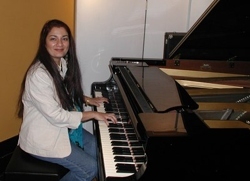 The jazz pianist will perform this evening as part of AHA! Night, a monthly arts and culture night in downtown New Bedford. Neal Weiss, owner of Whaling City Sound, said Ms. Borthwick’s music has earned her a place of respect among jazz musicians and fans. “Jazz is generally a man’s world, and she seems to have — I guess the expression is ‘street cred’ — credibility in that world, on the basis of her music alone,” he said. Her influences include Miles Davis and John McLaughlin, who played with Mr. Davis and later released his own albums combining Indian music with jazz.